Pen Pals & Picture Books: Happy Happy Lunch Box Hop! Happy Happy Lunch Box Hop! Hi kids! This week we're doing something new! (Or at least new to us.) We're joining in a blog hop! You see, one day Michelle (from Needle and Nest) and I got into a discussion in the comments section about our picky eaters and making them lunch. Needle and Nest with Michelle! Silver Shoes & Rabbit Holes! Pen Pals & Picture Books kind of fun! So dust off those lunch boxes and get ready to try something new! It should be a enjoyable and (hopefully) helpful week! I'm excited at least!! 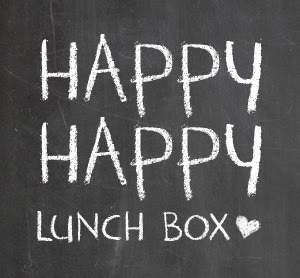 Here's to a happy happy lunch box, which I think equals a happy happy mommy!